While this is just a teaser clip — complete with dramatic, simulated visuals and space music — Musk is scheduled to reveal concrete information during a 30-minute press conference today at 11:30 a.m. PT (2:30 p.m. ET). The presentation will take place at the International Astronautical Federation in Guadalajara, Mexico. You can watch Musk’s press conference live right here and via the embedded video below. #2: This is where SpaceX’s Interplanetary Transport System comes in. #3: This is the ship SpaceX wants to build (the dot on the right is a person, for scale). #4: Musk estimates the price per trip will be be roughly the cost of buying a house in the U.S.
#5: Musk hopes it will eventually take 30 days to get to Mars. There could be a pizzeria on the ship. #6: Musk on the trip to Mars: “It’ll be like, really fun to go.” Ideas include zero-gravity games, movies, and restaurants inside the ship. #7: Musk isn’t sure how SpaceX will fund the entire project. 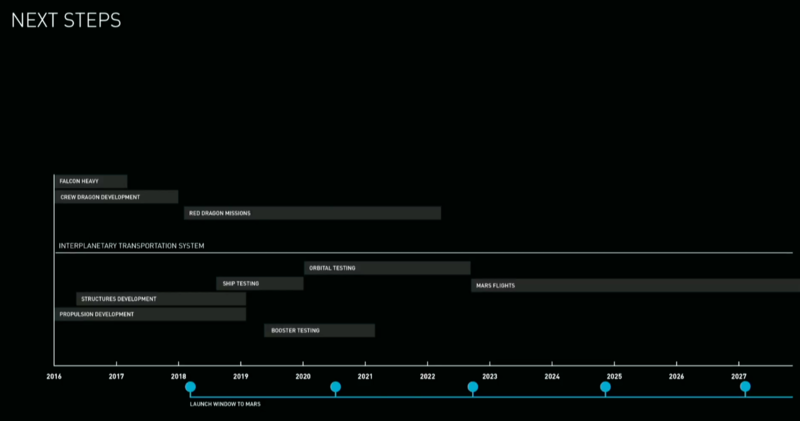 Also: Musk made a South Park joke during his presentation. Update 11:38 a.m. PT: The event will start soon, says Musk.